Iconici Radio broadcasted LIVE last night with your hosts Naiya Marcelo, Poetrynmotion and Syndee to bring you all the latest news on Fashion, Entertainment highlights and Hollywood celebrity gossip that has made headlines throughout the week. They were joined with the hilarious special guests Bryn Woznicki and Chelsea Morgan the Actresses, Producers and Directors of the upcoming feature film ‘Her Side Of The Bed’. 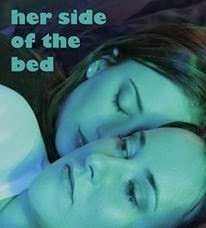 ‘Her Side Of The Bed’ is the story of Rachel Nolan, a recently dumped, 20-something writer living in New York. She moves in with her best friend, Nicole, who vows to get her over the breakup by any means possible. But after sharing an intimate night together, their friendship is forever changed. Hit that play button to hear all about how ‘Her Side Of The Bed’ came about, Rachel and Nicole’s characters, along with Bryn and Chelsea’s history in acting, writing and producing! How can you help support this film and so much more! Syndee, Naiya and Poetry also talked about Drake feeling funny over Macklemore’s text to Kendrick Lamar after the Grammy’s, L.A. news reporter Sam Rubin getting slammed by Samuel L. Jackson on LIVE Tv. Is there going to be new music from Danity Kane? Super model Stephanie Seymour’s latest shoot with her two son’s, is it too much?? Plus so much more! Visit Her Side of The Bed Facebook page and follow Her Side Of The Bed on Twitter! Check out ‘Her Side Of The Bed’ Trailor!